Authors may often think they could do a better job that their publishers, but they should resist the temptation to invest and try to affect policy. A certain distance between the creative and the business side of a book should be maintained. Many people working in publishing become writers, but the unwritten rule that employees should not submit their manuscripts to their employers, is a wise one. Of course there will be exceptions: Sir Stanley Unwin’s The Truth about Publishing was published with great success by George Allen and Unwin the company he founded — but one might reasonably expect that author to be able to write well on that topic, and anyway how can you say no to the boss? T. S. Eliot was a director of Faber and Faber, and he seems to have come out of it OK. I wonder if he had a colleague act as editor of his own poetry. Of course he didn’t decide to work at a publishing company because his books were selling lots of copies, and he hoped to cash in. This unfortunately would be the case of Mark Twain. Twain’s early books were published on subscription. This was quite a common method of publication in the nineteenth century. Salesmen went from door to door taking orders, and you could chose from various binding options, from plain to very elaborate. After a while Twain decided that he hadn’t been making enough from his very successful books. He founded the publishing house, Charles L. Webster & Co. in 1884, and the first book they published, in 1885, was Adventures of Huckleberry Finn. This made enough money for the company to fund publication of Personal Memoirs of U. S. Grant, which also did well despite the huge royalty payments due to Grant’s widow. Subsequent publications were unfortunately not as successful. Twain’s main preoccupation during the early 1890s was money. He produced a flurry of books, some grossly padded out, attempting to shore up his finances. In 1894 the bank foreclosed on a loan forcing the Charles L. Webster & Co. into bankruptcy. As two-thirds owner, Twain was hard hit. But he might have weathered the storm if it had not been for his wild enthusiasm for the Paige typesetting machine. He bought half the company from the machine’s inventor James Paige in 1886. At the height of its development, the Paige machine had over 18,000 separate parts, and was designed (with the help of one operator at the keyboard) to set over 8000 ems an hour. It could never be made to work reliably, spending most of its time in bits being repaired. 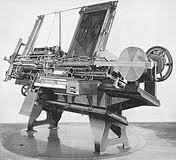 Before the Paige Compositor could ever be got going properly the Linotype machine had swept the market. By the time he had to declare bankruptcy in 1894, Twain had spent between $200,000 and $300,000 on an overambitious machine which never worked properly. Sir Water Scott is another author brought low by his involvement in publishing (and printing). 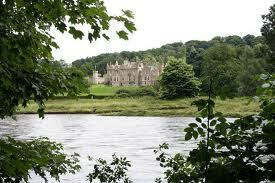 His friend James Ballantyne had established a press in Kelso in 1796, and was involved in the printing of Scott’s early works, the 3-volume The Minstrelsy of the Scottish Border and The Lay of the Last Minstrel. In 1809 Scott persuaded James and his brother to move their press up to Edinburgh, and invested in the company. By 1813 the firm was in financial difficulties, and from this date onward Scott’s writing was largely directed at making money to shore up his investment in the company. The first of the Waverley novels, Waverley, was published in 1814: Scott had pulled out from his bottom drawer a manuscript he had started to work on in 1805, but then abandoned. Seeking to make more money he entered into partnership with Archibald Constable in a publishing company named Constable. Almost every bill received by the publishing company was settled by discounting future earnings from Scott’s writing. Eventually the house of cards collapsed. Constables went under in the financial and banking crisis of 1825-1826 , bringing down the Ballantyne’s printing company too. Rather than declare himself a bankrupt, Scott placed his income and Abbotsford, his house, in a trust belonging to his and the Ballantynes’ creditors and spent the rest of his life furiously writing in order to pay off the debt. When he died in 1832 he had not succeeded, but of course his books continued selling after his death, and the debt was eventually discharged in full. Charles Dickens was closely involved in the running of Master Humphrey’s Clock and Household Words. He was however editor, and did not hazard his personal wealth on these periodicals. His childhood experience of his father’s imprisonment for debt in the Marshalsea probably protected him from financial speculation. Samuel Richardson was a printer/publisher who late in life turned to writing novels, often credited with inventing the genre. However he appears not to have printed and sold his own books. Benjamin Franklin became wealthy publishing Poor Richard’s Almanac as well as The Pennsylvania Gazette and this doesn’t appear to have hampered his prospects. But again he was printer first, author second.